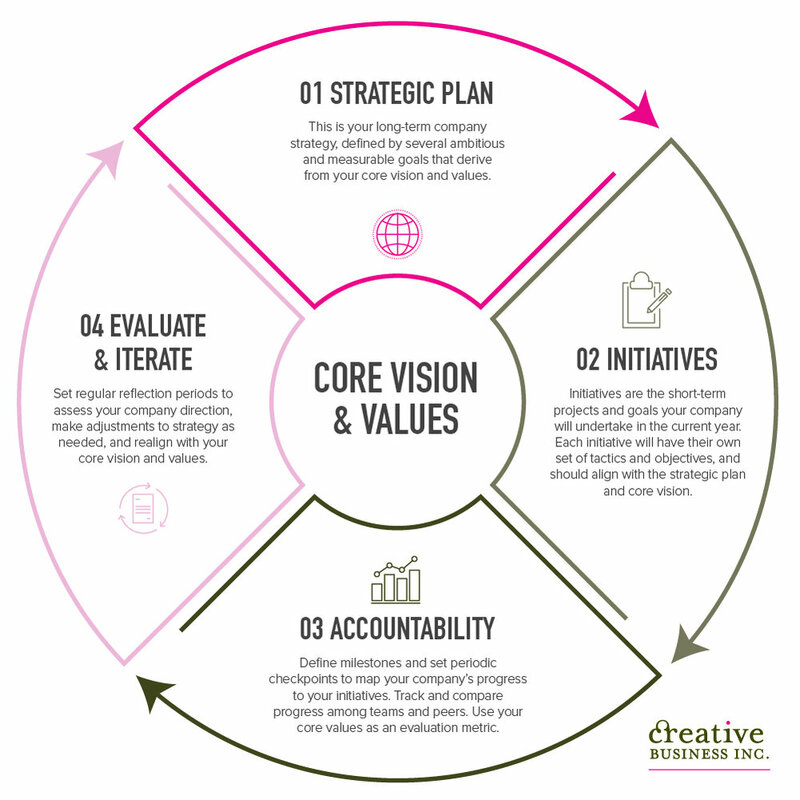 Strategic Leadership: The art of setting goals in a vision- and values-based framework — Creative Business Inc. This article is the fourth in our series on “Strategic Leadership,” where we explore the qualities of effective business leaders and how to hone our own leadership skills. One of the most important operational projects at any company is goal setting, a process that identifies upcoming objectives, lays out key initiatives, and defines the metrics by which to measure success. There are numerous popular methods to help companies set their goals for the year, from Peter Drucker’s SMART goals, to Intel and Google’s OKRs (objectives and key results), to psychologist David Van Rooys’s three-step BSQ method (Think Big, Act Small, Move Quick). In our experience helping other companies with their strategic planning, we at Creative Business don’t find that any one particular goal-setting method is necessarily better than the other. But one thing we have noticed is that most of these frameworks only focus on initiatives and results—there’s rarely a tie-in to the bigger picture. When that happens, it becomes much too easy for employees to focus only on achieving individual objectives and lose sight of the company’s main purpose and vision. Instead, goal setting processes should always remain aligned with your company’s core philosophy and values in the center of it all. In the center of this framework is your company’s Core Vision and Values, two aspects that serve as a foundation for your company. Your core vision is your lofty enduring goal. It should not only define what your main purpose is as a business, but also set a bar that is almost unattainable. David Packard calls it the "guiding star on the horizon,” a purpose forever pursued but never reached. At Creative Business, for example, our vision is to be the "gold standard" of financial services companies. As times change, so will the standards for our industry, and we will have to continuously evolve and improve in order to fulfill our vision. Core values are the essential and enduring principles that define what your company stands for. They are the bedrocks upon which your entire company runs, from hiring and management to strategy and operations. Setting your company’s core values seems simple, but can be one of the hardest aspects of your company strategy. As management expert Jim Collins (author of Good to Great) explains it, “you cannot ‘set’ organizational values, you can only discover them.” Your core values are in large part defined by the behavior and culture of the people within your company, and are extremely hard to dictate. To properly identify your company’s authentic core values, Collins recommends forming a “Mars group.” Imagine you’ve been asked to recreate the very best attributes of your business on another planet, but you can only send 5-7 individuals to represent you. Who would you send and why? Typically these would be the people who are exemplars of your organization—they demonstrate the highest levels of competence, have the highest levels of credibility, and have a gut-level understanding of the core values. The Mars group should then be asked certain questions: What core values do you bring to your work and hold so fundamental that you would have them regardless of whether or not they are rewarded? What values would you keep even if you were to switch organizations? And most importantly, would these values be valid 100 years from now as they are today? By drilling down into the values of your best employees, you can properly identify the most important values driving your organization's culture, and consequently use them to drive your company’s long- and short-term goals. We want reach 10 million happy customers in the next 10 years. We want to be the #1 rated retailer in our category by 2025 for product selection and customer service. We want to achieve 70% market share in the U.S. market by 2030. Run a splashy social media marketing campaign to attract new buyers to our website. Conduct outreach to encourage customers to leave online reviews for our products and services. Open 5 new locations this year in the western U.S. Although company leadership is responsible for establishing the Core Vision and Values, as well as for laying out the initial Strategic Plan, setting the Initiatives should be a phase undertaken with the rest of management and (if feasible) the whole team. At this point, companies can decide to use whichever goal-setting methods (SMART, OKRs, BSQs, etc.) that suit them and their teams. More important is that the Initiatives and the individual goals and tactics that go along with them always align with the Core Vision and Values of the company. By keep goal setting within this framework, business leaders encourage employees to infuse more purpose into their work and take ownership in setting and achieving their own professional goals. Define milestones for strategic initiatives. How long is the timeline for achieving your initiative? What major milestones and deadlines do you need to hit along the way in order to make sure you get there? Don’t let major goals make it into your strategic plan without defined milestones and concrete timeframes. Set periodic goal checkups. At Creative Business, our team does weekly checkups to share progress as a team. Although some companies may find weekly meetings too frequent, we recommend going no longer than one month without a goal checkup for every single employee. Track and compare progress between peers and teams. One mistake that companies often make is allowing individuals and teams to work in silos, which discourages open communication and transparency. Instead, use the period checkups as a way to put the teams together and compare progress on goals. When conducted in a respectful environment, it allows for employees to comfortably celebrate successes and learn from failures. Use your core values as an evaluation metric. Team checkups are a great time to reiterate your core values within the company. By acknowledging and rewarding those employees that not only have hit their targets, but have done so while upholding the values of the company, you reinforce what's important and encourage others to follow in their footsteps. Sometimes things don’t move along as planned, and that’s ok. During your periodic checkups you might find that certain initiatives simply aren’t working, or that the market conditions have changed drastically enough that you need to rethink some of your more ambitious strategic goals. Building in an evaluation and iteration process into your overall strategic process allows you to have a “slow down and think” phase, where you can honestly assess how things are going and make adjustments as needed. The tendency in many scale-up businesses is either to be too quickly reactive, or to push harder for newer, bigger, and faster, without taking the time to reflect on the bigger picture. Don’t fall into that trap—map everything back to your Core Vision and Values. Every process in this goal-setting framework touches back on this central philosophy. Companies that consistently change direction without referencing back Core Vision and Values often find themselves wandering too far outside of the circle—work becomes more chaotic and communication breakdowns happen much more frequently. Think of your Core Vision and Values as a compass. From setting the initial roadmap and directions, to the times when you get lost and have to double back, your Core Vision and Values should always be there, guiding your company back in the right direction.